KantanMT had an exciting year as it transitioned from a publicly funded business idea into a commercial enterprise that was officially launched in June 2013. The KantanMT team are delighted to have surpassed expectations, by developing and refining cutting edge technologies that make Machine Translation easier to understand and use. Here are some of the highlights for 2013, as KantanMT looks back on an exceptional year. The year started on a high note, with the opening of a second office in Galway, Ireland, and KantanMT kept the forward momentum going as the year progressed. The Galway office is focused on customer service, product education and Customer Relationship Management (CRM), and is home to Aidan Collins, User Engagement Manager, Kevin McCoy, Customer Relationship Manager and MT Success Coach, and Gina Lawlor, Customer Relationship co-ordinator. KantanMT officially launched the KantanMT Statistical Machine Translation (SMT) platform as a commercial entity in June 2013. The platform was tested pre-launch by both industry and academic professionals, and was presented at the European OPTIMALE (Optimizing Professional Translator Training in a Multilingual Europe) workshop in Brussels. OPTIMALE is an academic network of 70 partners from 32 European countries, and the organization aims to promote professional translator training as the translation industry merges with the internet and translation automation. The KantanMT member’s community now includes top tier Language Service Providers (LSPs), multinationals and smaller organizations. In 2013, the community has grown from 400 members in January to 3400 registered members in December, and in response to this growth, KantanMT introduced two partner programs, with the objective of improving the Machine Translation ecosystem. To date, the most popular target languages on the KantanMT platform are; French, Spanish and Brazilian-Portuguese. Members have uploaded more than 67 billion training words and built approx. 7,000 customized KantanMT engines that translated more than 500 million words. As usage of the platform increased, KantanMT focused on developing new technologies to improve the translation process, including a mobile application for iOS and Android that allows users to get access to their KantanMT engines on the go. KantanMT have been kept busy continuously developing and releasing new technologies to help clients build robust business models to integrate Machine Translation into existing workflows. KantanAnalytics™ – segment level Quality Estimation (QE) analysis as a percentage ‘fuzzy match’ score on KantanMT translations, provides a straightforward method for costing and scheduling translation projects. BuildAnalytics™ – QE feature designed to measure the suitability of the uploaded training data. The technology generates a segment level percentage score on a sample of the uploaded training data. KantanWatch™ – makes monitoring the performance of KantanMT engines more transparent. TotalRecall™ – combines TM and MT technology, TM matches with a ‘fuzzy match’ score of less than 85% are automatically put through the customized MT engine, giving the users the benefits of both technologies. KantanISR™ Instant Segment Retraining technology that allows members near instantaneous correction and retraining of their KantanMT engines. PEX Rule Editor – an advanced pattern matching technology that allows members to correct repetitive errors, making a smoother post-editing process by reducing post-editing effort, cost and times. Kantan API – critical for the development of software connectors and smooth integration of KantanMT into existing translation workflows. The success of the MemoQ connector, led to the development of subsequent connectors for MemSource and XTM. KantanMT sourced and cleaned a range of bi-directional domain specific stock engines that consist of approx. six million words across legal, medical and financial domains and made them available to its members. KantanMT also developed support for Traditional and Simplified Chinese, Japanese, Thai and Croatian Languages during 2013. KantanMT received awards for business innovation and entrepreneurship throughout the year. Founder and Chief Architect, Tony O’Dowd was presented with the ICT Commercialization award in September. In October, KantanMT was shortlisted for the PITCH start-up competition and participated in the ALPHA Program for start-ups at Dublin’s Web Summit, the largest tech conference in Europe. Earlier in the year KantanMT was also shortlisted for the Vodafone Start-up of the Year awards. KantanMT were silver sponsors at the annual 2013 ASLIB Conference ‘Adopting the theme Translating and the Computer’ that took place in London, in November, and in October, Tony O’Dowd, presented at the TAUS Machine Translation Showcase at Localization World in Silicon Valley. KantanMT have recently published a white paper introducing its cornerstone Quality Estimation technology, KantanAnalytics, and how this technology provides solutions to the biggest industry challenges facing widespread adoption of Machine Translation. For more information on how to introduce Machine Translation into your translation workflow contact Niamh Lacy (niamhl@kantanmt.com). 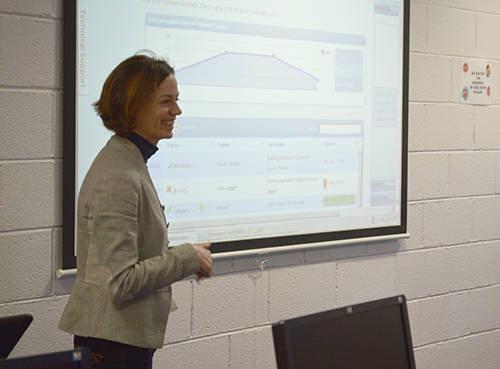 Lead by Dr. Dorothy Kenny and Dr. Stephen Doherty, over 50 DCU post graduates are learning to train Machine Translation (MT) engines in a variety of different languages and getting first-hand experience of using the latest KantanMT technology. Using DGT translation memories from the Acquis Communautaire (an open source translation memory directory provided by the European Commission), students are learning not only how to build engines and translate documents, but also how to evaluate their engines’ quality by utilising KantanMT’s automatic quality evaluation metrics. Dr. Kenny and Dr. Doherty offered encouraging feedback from their experiences while teaching with KantanMT. They particularly liked ‘the intuitive and easy to navigate user interface and the speed of use’ which meant that the majority of students were able to build their first engine within the space of a one hour lab. Dr. Kenny and Dr. Doherty stressed the importance of proper education when it comes to translation technology. They aim to encourage their students to use Machine Translation technology in a proactive rather reactive manner in order to “empower them as professionals”.